My work is an invitation to experience the healing world through simple action and sculpture. The healing world, to me, encompasses a variety of international healing practices. I see it as an umbrella for wellness that is outside Western medicine, ranging from herbalism (making medicine from plants) to India’s Ayurvedic medicine, which includes seasonal eating, body type identification, and plant-based remedies. In 2008 I became ill with an undiagnosable stomach ailment. After six months of testing in Western medicine, I was introduced to acupuncture, which led me to learn more about alternative health ideologies. As I slowly emerged from my health crisis, I made drawings and sculptures about plants, theory, and healers to catalogue information. As I continue to understand Eastern medicine, herbalism, and meditation through personal experience, I apply my research to participatory sculpture. 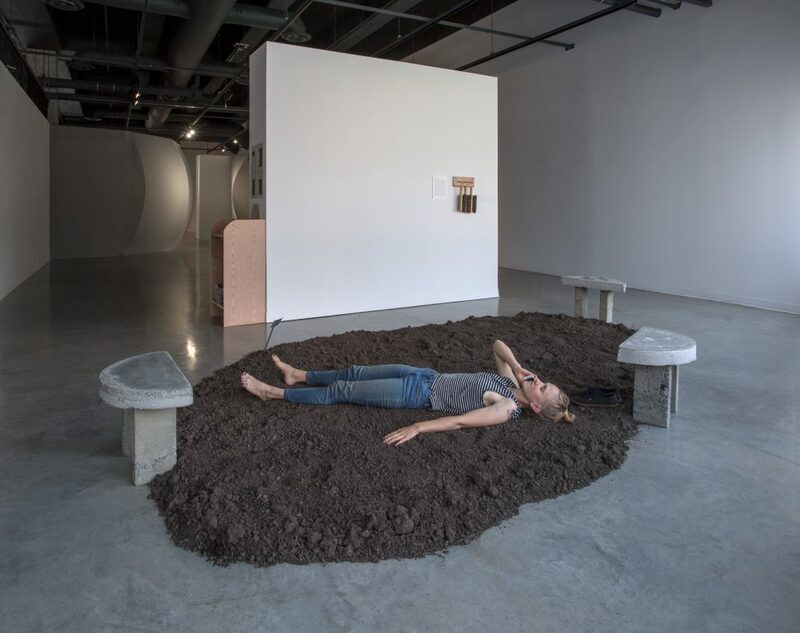 In Death Bed, I asked the viewer to lie on a coffin surrounded by wildflowers and contemplate death while experiencing plant spirit medicine. In Energetic Flower Stand, I invited the viewer to walk with flowers found in Bach flower remedies. Each bouquet offered healing for different emotional states. Whether an investigation into vibrational medicine or an exploration of the changes in cellular metabolism through salt therapy, my sculptures frame specific aspects that intrigue and challenge me. In order to create access points to these complex systems, I pair concepts from the healing world with familiar actions. My art encourages the public to question wellness through the body in ordinary activity—to sit, walk, rest, or simply listen. Prescription Gardens are three gardens located across the city. Each garden hosts plants that treat the mind states of greed, aversion, and delusion. When you enter a garden, a small bench welcomes you. You sit among the flowers and call a phone number. The answering machine guides you through a menu of plants that treats your malady. The plants growing before you are identifiable by small placards. 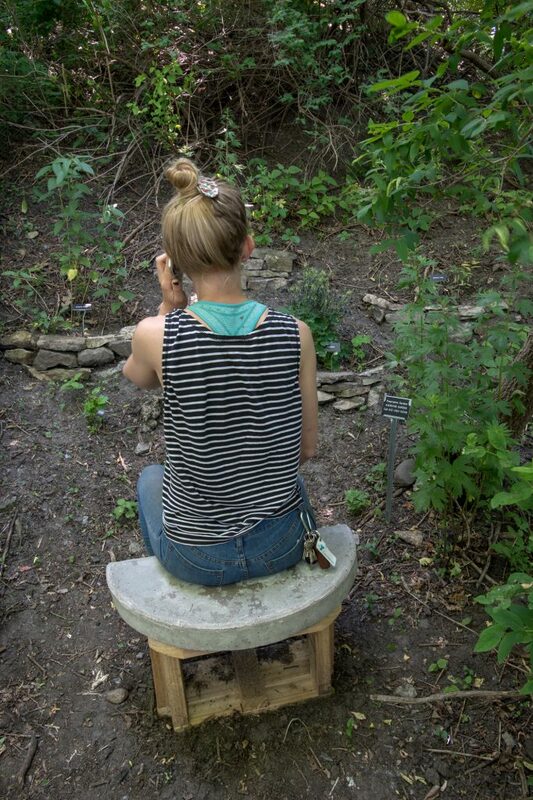 A voice on the phone leads you on a meditation that connects you to the plants. You move through the menu based on your individual needs, and you hang up when you are ready. The mind states addressed by Prescription Gardens are found within Buddhist philosophy. In the midst of illness spurred by stress, I started attending Common Ground Meditation Center in Minneapolis. There I gained the skills to cope. I have avoided expressing my experience with Buddhism in my work because of the tenuous relationship between art and religion, but I use it now to share philosophies that benefit our ability to understand emotions, honor them, and react with gentle awareness. With the current presidential administration, I see this need as urgent. Our emotions are valuable. They hold intelligence that informs action. Let’s understand them with attentive tenderness. Listen to the body. Nurture the heart. Jess Hirsch is a sculptor and installation artist living in Minneapolis, Minnesota. 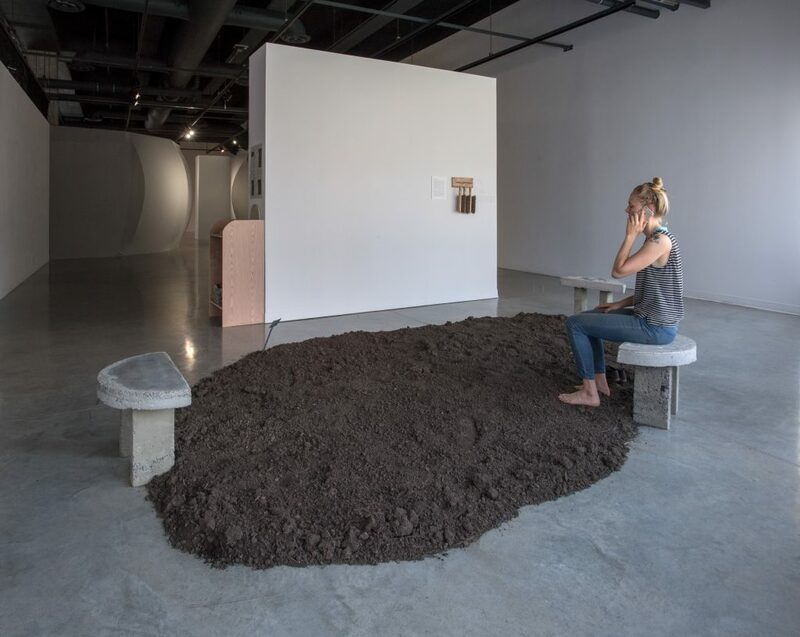 Hirsch explores alternative medicine and healing modalities through interactive sculpture. She received her BA from Lewis & Clark College in Portland, Oregon in 2007 and her MFA from the University of Minnesota in 2013.